Three points at Rovers? No Deal! Looking for a repeat of the four-one home drubbing in early September two CTSA coach loads of CTFC fans set off to Bristol Rovers on Saturday confident of another positive day. Leaving at the civilised time of 10am it didn’t take long to complete the 1st leg of the journey to an M4 service stop, and then during the final leg into Bristol we all took part in Travel Ken’s famous football quiz. After a link up between the two coaches CTSA first timer Peter O’Brien won with 17 out of 26. His prize is a free trip with us later in the season. Peter said “It’s nice to have won this today especially after only making a very late decision to attend the match”. We can reveal that Peter only popped out to buy his Hull ticket but was persuaded by Barbara Robinson to take the Bristol trip, after receiving permission from his missus! Peter O'Brien, winner of the Travel Ken prize for football knowledge! In the Rovers club house I met Chris Nolan of Southgate for the first time. He is one of the new collection of supporters picked up from last season’s cup run. He explained,”during last season my mate told me to come and watch Crawley Town, they never lose! 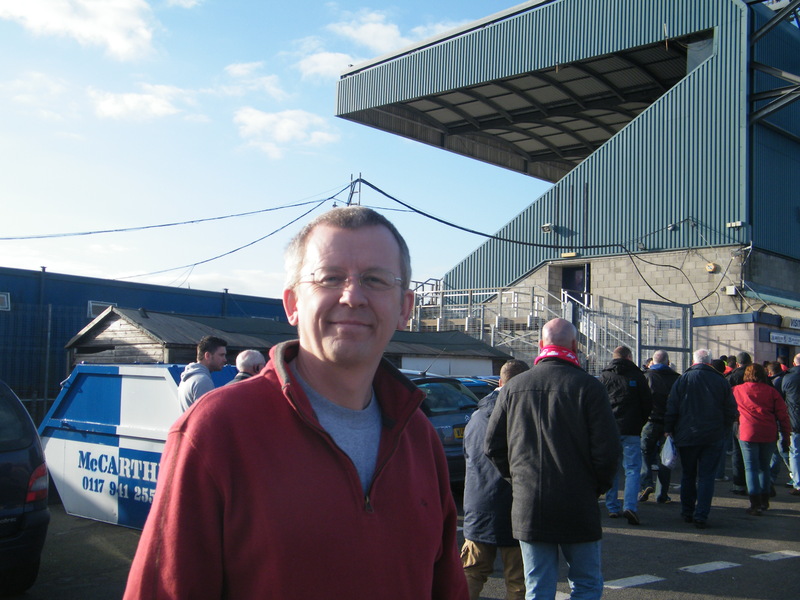 I went to the Torquay FA cup match and was hooked!” He has been watching the Reds ever since and will making his way to Plymouth, Hull and Bradford over the next 3 weeks. Pre match ale at the Rovers Return! 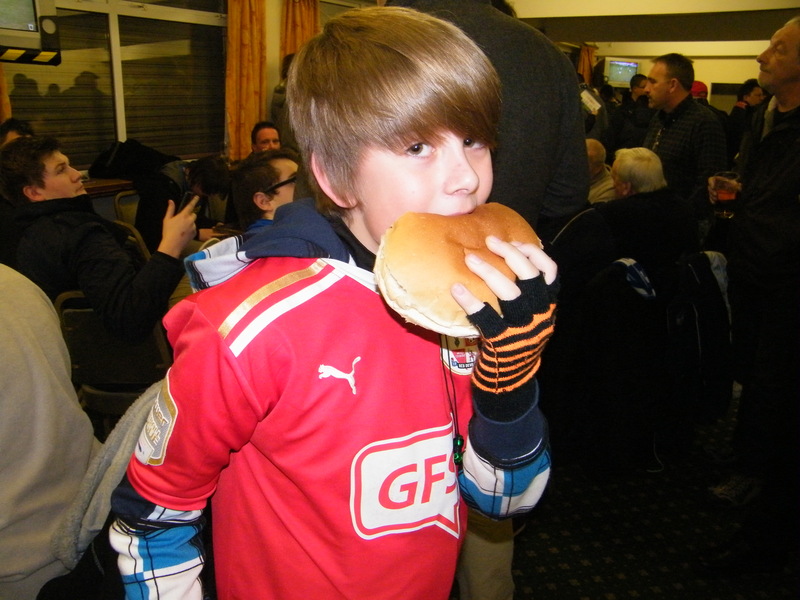 Either this boy is very small or that burger is unnaturally large! 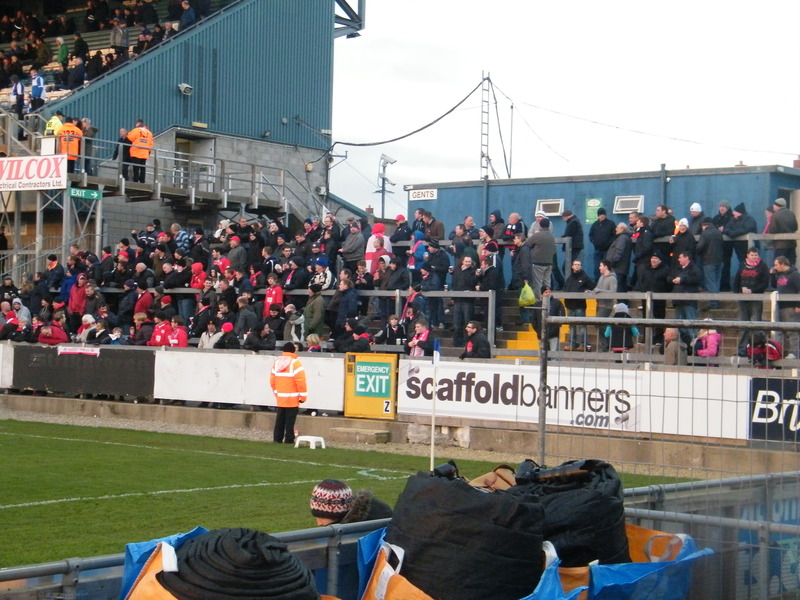 Most Reds fans were housed in the uncovered away terrace while some opted for a covered seat behind the goal. Funny old ground the Memorial Stadium. There are around 8 differing stands and terrace areas ranging from dilapidated concrete steps to a very modern and expensive looking main stand. That said, the home terrace behind the goal was packed to the rafters and one would imagine that a lot of noise would have been generated had a goal been scored. Luckily we never had to find out! 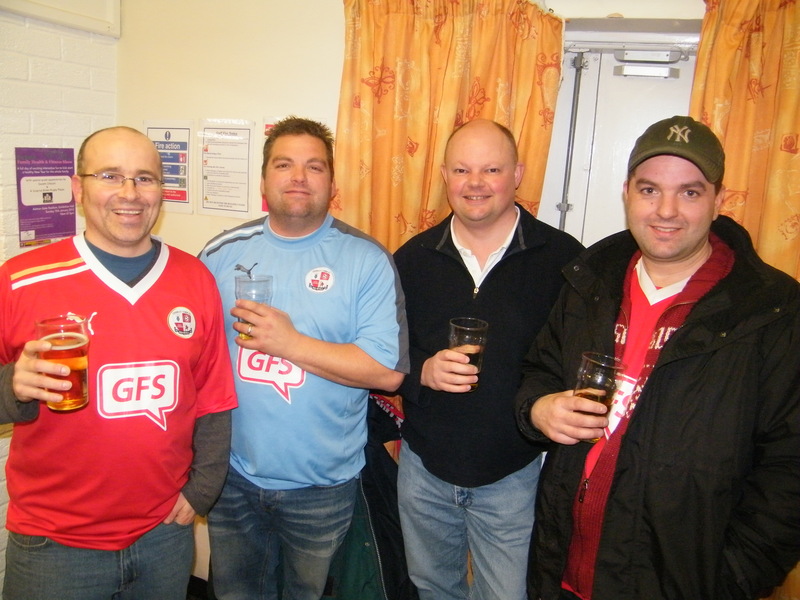 Some of the CTFC Massive hoping it doesn't rain! Unfortunately neither team could muster a goal during a frustrating 90 mins. If a goal had arrived then it might of sparked the match into life, but I have a feeling that if they were still playing now it was still be 0-0. That said, it’s another priceless point towards promotion to League One. The weather didn’t help our spirits- winter certainly made a visit to Bristol during the afternoon. After weeks of tepid temperatures it might have been glorious sunshine but it was flipping freezing and by the end it was nearly Arctic. It was lovely to get back on the warm coaches. 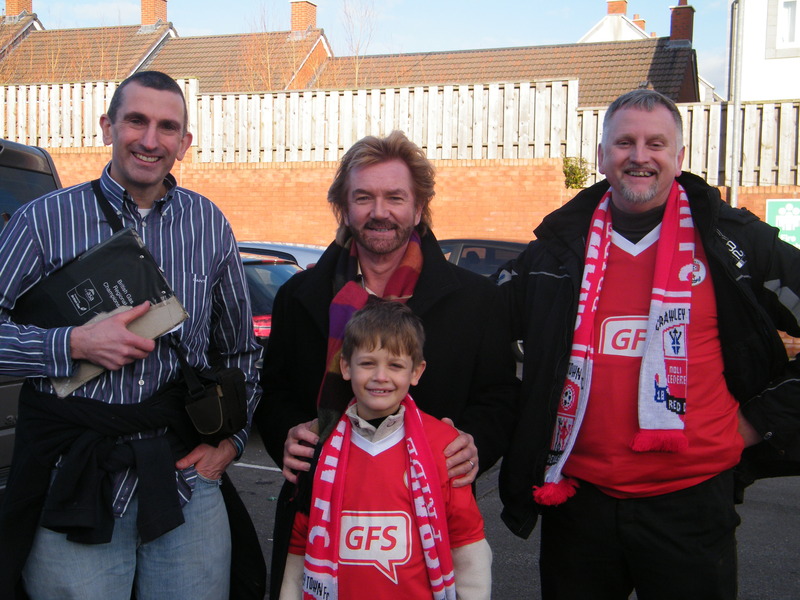 I met Noel Edmonds in the car park. Deal or No Deal is one of my favourite programmes. I said to him, “I try to watch your programme everyday.” He replied, “get a life!” Suddenly I decided that I would be turning the TV off after Countdown! I will not be travelling to Plymouth next week but hope that everyone enjoyed their Bristol Rovers experience and will be looking forward to seeing you all on the way to Hull City.